The breakdown of negotiations with employers on the issue of wages is at the origin of the movement that will affect all sectors. Few trains, subways, couriers, care and, perhaps, open schools: Belgium will be almost stopped, Wednesday, February 13, following the call for a general strike launched by the powerful unions of the kingdom. The movement will start on Tuesday, February 12, at 10 pm, and will end the next day, at the same time. All sectors, including commerce, private companies and administrations, should be affected by a movement that promises to be massively followed, according to a common front bringing together the socialist, Christian and liberal unions. Held by new rules, the Belgian National Railway Company (SNCB) will, however, circulate a few trains as part of the minimum service to which it is now compelled. The sky controllers have also filed a strike notice. Some companies have planned to divert to the nearest Dutch or French airports (Lille-Lesquin and Orly). Brussels Airlines canceled more than 200 flights and offered some 16,000 passengers either a refund of their ticket or a postponement to another date. Charleroi-Brussels South airport will be completely paralyzed. Other sectors (hospitals, local and federal police, waste collection) will be affected and a call for work stoppages has also been issued to dockers and truck drivers. In addition, dams should be installed near shopping centers and businesses. The country had not experienced a strike of such magnitude since December 2014, when unions protested against the economic program of the coalition led by Liberal Charles Michel. He is now at the head of a minority team since the departure in December 2018 of ministers of the Flemish national party N-VA, in disagreement with the signature, by Mr Michel, of the United Nations pact on migration. . The government is henceforth in charge of the management of "current affairs" until the end of May, date of the federal and regional elections - which will be coupled, in Belgium, with the European ones. As the Chambers are to be dissolved in March, the margins of parliamentarians are also almost nil: no proposal can lead to a change of policy for the center-right government. The union warning shot appears therefore more as a warning to political parties before the ballot than as an action that can be used to translate the claims into action. It is the recent breakdown of negotiations with employers on the issue of wages for 2019 and 2020 that is causing this outburst. Trade union officials deem insufficient an increase of 0.8% (in addition to automatic indexation, calculated on the increase in the cost of living) provided by the Central Council of the economy. This joint consultative body - it brings together industry, trade unions, consumers ... - advises the government and the Parliament and, every two years, it prepares a report before the negotiation of the interprofessional agreement. The question of purchasing power has been revived by the actions, at least in Wallonia, of "yellow vests" which model their way of acting on those of their French counterparts. The employer's refusal to consider increases of more than 0.8% has definitely put it at the heart of the electoral campaign, even if, for the moment, it is the theme of climate change that occupies all minds, account given the strong mobilization of tens of thousands of young people, who jostle the parties and organize themselves outside the unions. 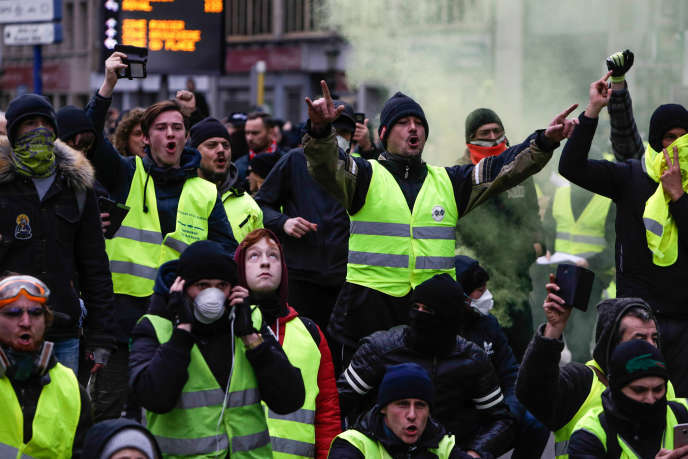 Read also Strikes in Belgium: the unions try to recover the "yellow vests"
In a recent report to the world of politics, the Federation of Enterprises of Belgium (FEB) stressed that competitiveness and wage moderation should remain priorities. The employers proposed in particular to abolish the automatic indexing system or to limit the duration of the unemployment benefits. The FEB points out that the average wage gap between Belgium and its main partners (Germany, France and the Netherlands) remains at 11%, which is a long-term threat to its competitiveness. The bosses call for a reduction in corporate tax and social security contributions, demands that the current coalition, presumed closer to the world of business than workers' organizations, could only partially satisfy. The government of Mr. Michel, whose slogan was "Jobs, jobs, jobs! " Prides itself on bringing the unemployment rate back from 8.5% in 2014 to around 6% - 8.4% in Wallonia - today. On the other hand, it has not brought any real solution to another problem denounced by the FEB: the vacancy of many technical jobs (about 150 000), which strongly handicaps a series of industrial sectors, while the unemployment rate of Young people under 24, even though it is falling, still stands at 16.3%, according to the official Statbel organization.